The Representatives of the eight Episcopal Conferences of the Catholic Church in Africa are expected to gather in Luanda, Angola, from July 18 to 28, 2016; for the triennial meeting of the Symposium of Ecclesiastical Conferences of Africa and Madagascar (SECAM). The general theme of the one week gathering is: New Pastoral Challenges Facing the African Family Today and Finding New Ways of Evangelizing the Families. The meeting which is expected to deliberate on administrative matters concerning all the eight regional conferences will also discuss matters affecting the lives of African people like: the quality of leadership, terrorism, challenging economy, debilitating poverty, unemployment and war. Other issues of concern to be addressed by the bishop are: the growth of the church, the family and the youthful energy of Africa. The meeting will also feature a workshop and presentation of papers. Key presentations at the gathering include: The Case Cape Verde by His Eminence, Arlindo Cardinal Gomes Furtado, Archbishop of Santiago, de Cape Verde; The African Perspective, by Bishop Emilio Sumbulelo of Uije, Angola; The Influence of Modern Media and New Ideologies on the Family in Africa Today, by Bishop Emmanuel Adetoyese Bsdejo of Oyo, Nigeria and Making SECAM a Stronger and More Committed Family of God in our Continent by His Eminence, Philippe Cardinal Quedraogo of Ouagadougou, Burkina Faso. 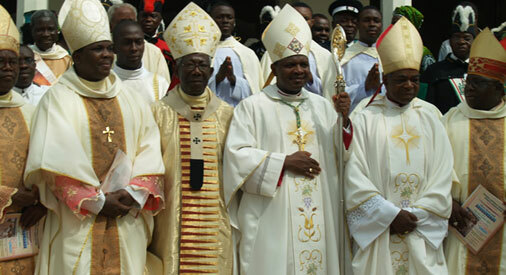 The Catholic Bishops’ Conference of Nigeria (CBCN) is expected to be represented by a powerful delegation of the conference at the meeting.